As an agility instructor, I have the best intentions for my students, I want them to succeed, grow, meet their goals, and have fun! I have been doing agility for 15 years and sometimes I take things for granted; table criteria is an example. If you train a dog through our program, we have done the table from the ground up and talked about the difference between USDAA and AKC and when to release your dog and how to keep your dog motivated on the table and how to keep them staying on the table and etc. BUT in this situation it is a a junior handler who is learning handling on a seasoned dog. I put her in a Novice Handling class, her dog was already trained on the equipment, and we just need to teach the junior handler some moves. So she didn’t hear the spiels about the table. And even though I am pretty sure we did the table once or twice in her class, I am 100% sure we rewarded the dog on the table and we didn’t talk about the “rules” of the table in a competition. After six months this junior handler entered her first real trial, AKC at the Masters level (the dog has her MACH and has been to the invitational.) 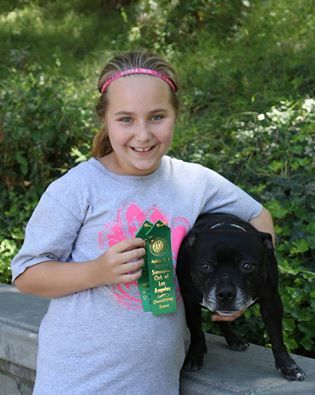 I know her goal was to have fun, and she loves her dogs, and her parents promote a good attitude in sports. In her standard run, as the dog preformed the table, the junior handler stepped into pet and hug her dog; she had already NQ’d so the E didn’t really matter. How cute is that? How cool is it that the handler loves her dog so much it was a natural reaction to step in and reward? As the coach and instructor I kicked myself for not thinking to explain the rules for the table. I took it for granted! Her parents never thought of it either, why would we? It is a very cool testimony to this junior handler’s relationship with her dog and her attitude towards competition that she loved on her dog in the middle of the run. The judge didn’t whistle her off; instead she met her at the finish line to explain the rules (which I WISH I had thought to do.) Doing agility has an aspect of a learning curve! Teaching beginners is tough, and I have a knack for teaching in general, but there are so many things that have to be learned out in the ring! This junior handler and her dog went on to earn their first double Q the next day and I know they are destined for great things! What a beautiful start to their career! This entry was posted in Agility and tagged agility, dog training by ffluffy. Bookmark the permalink.